If you'd like to try a dive that's a little more adventurous and out of the ordinary, join our expert divemaster guides for an exciting Specialty Dive excursion off the coast of the Bahamas. Our professional dive operators provide some wonderful specialty expeditions that include Night Diving, Diving with Sharks, Wreck Diving, and Blue Hole Diving. You won't enjoy a more thrilling experience than while participating in a Shark Dive. Our pro divemasters possess the broad knowledge of the Bahamian waters that allows them to provide a safe and enjoyable dive. If you have a large vacation party, or you'd like to design your own personal dive excursion, we offer fully adaptable Private charter excursions. Our accommodating staff will transport you in one of our customized dive vessels to the amazing dive destinations of your choice. If some of your party has not yet achieved Open Water Dive Certification, our diving instructors can provide Resort Course instruction on this private trip. Private Charters offer vacationing divers complete flexibility. If you are a thrill-seeker, the Stuart Cove Shark Adventure Dive is the perfect scuba diving trip for you. Your pulse will race as the Caribbean Reef Sharks circle as our divemaster feeds them. 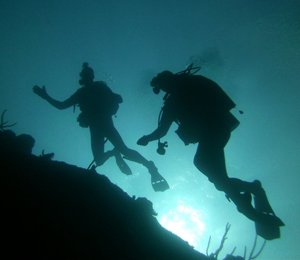 This diving excursion also includes an exciting dive alongside a dramatic wall. 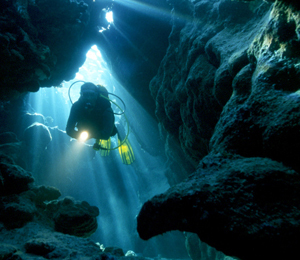 Don't miss your chance to dive at one of the most unique Scuba Diving attractions on Earth, Bahamas Lost Blue Hole. With a diameter of one hundred feet and a depth of two hundred feet, this enormous crater in the sea floor is home to an astounding array of marine life. The Nassau Ocean Wall & Reef dives takes Bahamas scuba diving to the next level, allowing you to explore one of the more unique dives located off the coast of Nassau. The Ocean Wall dive allows you to see a different type of underwater scene. 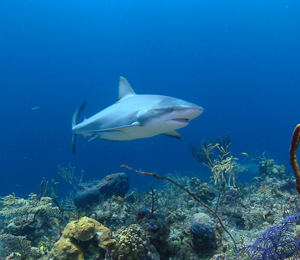 While many of the Bahamas scuba diving trips take you out to the fascinating and extensive coral reef gardens, this particular scuba dive excursion takes you to an ocean wall.